Recorded in many spellings as shown below, this very interesting surname is usually English, but may also be Irish, although the origins are the same. It is almost certainly for most nameholders topographical, and would have originally described someone who lived in a house or cottage in a nook or corner of land, or a bend in a river. If so the derivation is from the Old English word 'hyrne', or the later Middle English 'herne'. There is a quotation from the famous medieval writer Geoffrey Chaucer which refers to - 'Lurking in hernes, and in lanes blinde'. The villages called Chaucer Herne in the county of Kent and Hurn in the county of Hampshire are examples of placenames. However as the word 'hern' is also the Middle English for the bird known as the heron, there is a possibility that the name may have been used as a nickname for a person resembling in some way the bird. 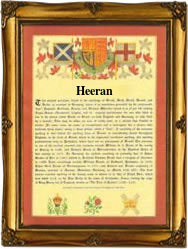 The modern spellings of this name include: Hearn, Hearne, Hearon, Hearons, Heeran, Heeron, Heerin, Hurn, Hurne, Hern, Herne, and Heron. As examples from early church registers we have Alice, daughter of Edward Hearn, was christened at St. Martin Ludgate's, in the city of London, on December 6th 1579, whilst another Alice, this time spelt Hearne, married William Harneyman, on July 23rd 1584, at Allhallows church, London Wall. The first recorded spelling of the family name is believed to be that of Gunnora de la Hurn. This was dated 1279, in the Curia Regis rolls of Hampshire, during the reign of King Edward 1st of England, 1272 - 1307. Throughout the centuries, surnames in every country have continued to "develop" often leading to astonishing variants of the original spelling.